There is a wide selection of kitchen light fixtures – island lights, kitchen chandeliers, pendants, and ceiling lights to name a few. The good thing is they are all available in the market for our choosing; the challenge is picking the best design. To get to a well-made decision, many things have to be considered such as the style that we want to achieve, our budget, and more. Basically, we may consider picking something small when our space ranges from small to medium, while we can pick out larger ones when our kitchen space is a tat larger. Today is a good day to check out a list wherein we can see how unexpected choices in decor or in lighting keep an island or a kitchen from being boring. You can judge the kitchen design that we will be showing you from our list of 15 Distinctly Unique Kitchen Island Lighting Ideas and see how designers or maybe the home owners themselves wanted to achieve a kitchen that has conversation pieces – their wonderful lighting choices! Notice how cool the bar pendant light is and the front foyer light. Also note the piece of art by the foyer. 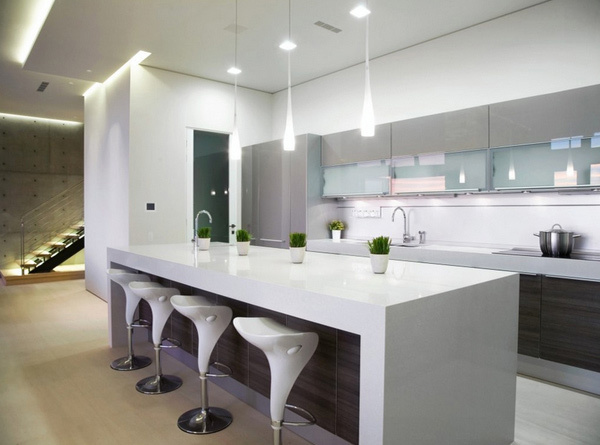 The dropping pendant lighting in this kitchen reminds us of tears that fall. It complements the Caesarstone countertop. How do you like seeing unique lighting like these? 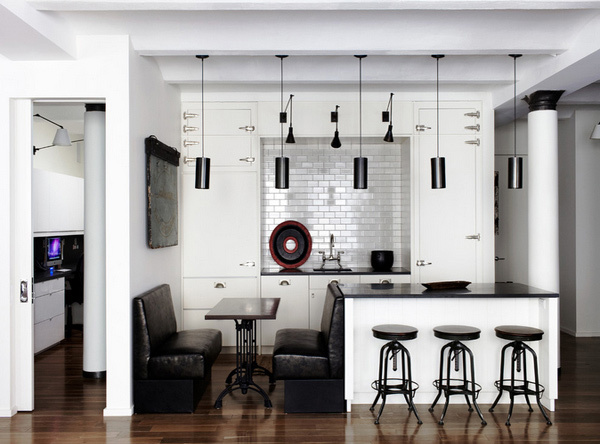 They are clear oblong pendant lights that contrast the dark color of the wooden kitchen bar stools and the cabinetry too! A row of three white pendant lights hang above the central island adding a splash of light in this orangey living room. 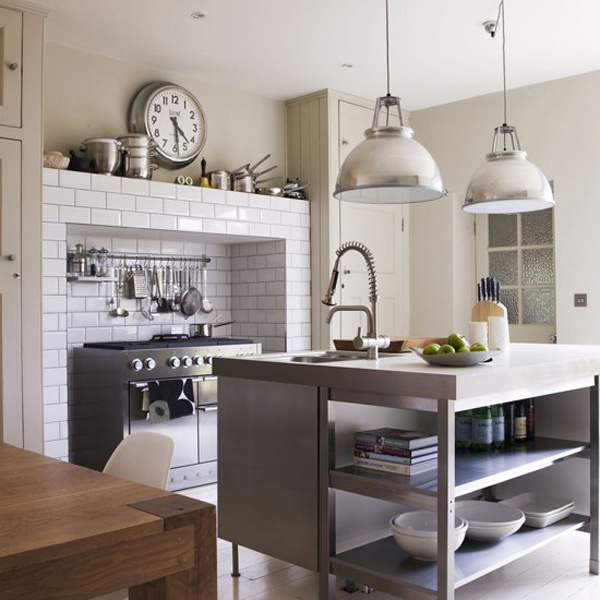 White and stainless steel furnishings dominate this stylish, utilitarian kitchen. Using the original brick alcove to house a modern range is a functional and easy use of space. The pendant lights were purchased at Benson Lighting in Miami, Florida and we are guessing people loved this design because it is unique and class! The client chose a vibrant glass mosaic backsplash, with elements of the sun and sky reflected in the pieces. Chell says that it was important for her clients to bring elements of color and light into their home. 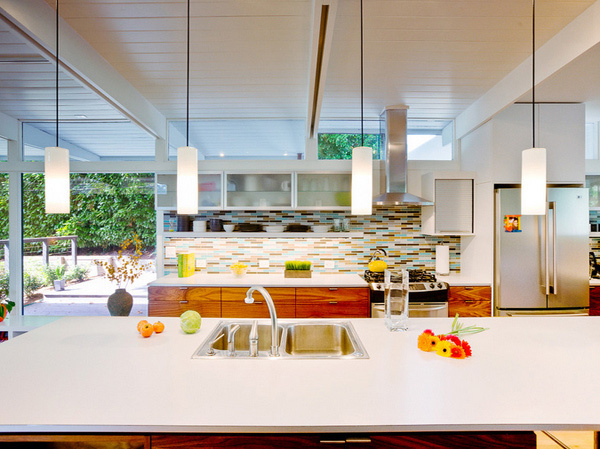 Simple pendant lights hang over the kitchen island so that the backsplash would take center stage. 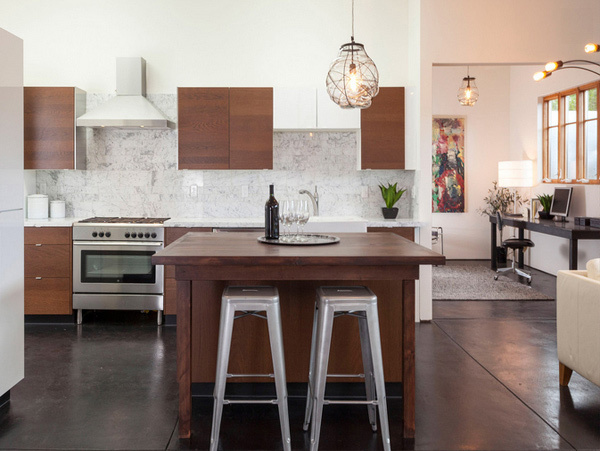 The Meridian pendant lamp sure is a common design but sure is eye-catching because of the tractor-seat bar stools throw the angular kitchen a few curves. 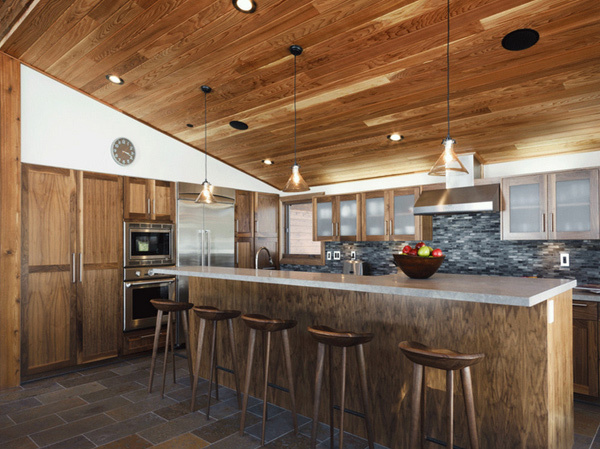 The stools’ walnut finish makes a great layering material to the cedar ceiling and wood cabinetry. 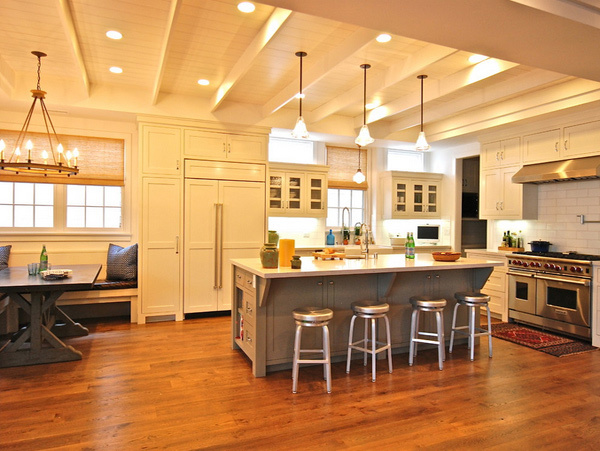 Gorgeous dropped ceiling and industrialized pendant light that makes this kitchen pretty much modern. Around the corner a wet bar helps take some of the entertaining load off the kitchen. Most of the same materials were used for cohesiveness – including the slate counters, ash cabinetry, and not to mention the lovely pendant lights. 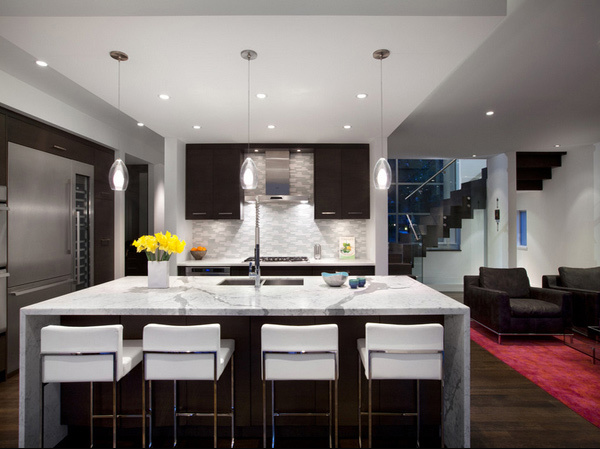 The large red pendant light was the inspiration for the look and makes a fabulous focal point. 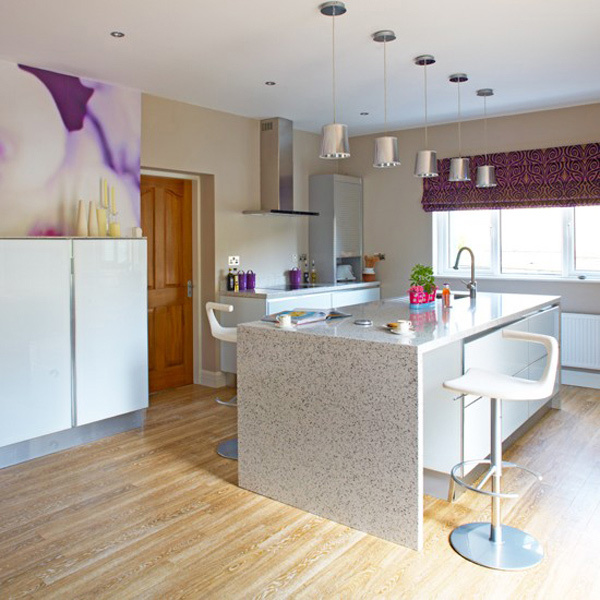 The central island unit makes a useful breakfast bar area and also provides extra cupboards and drawers. We love the pendant lights of this kitchen and take note that the whiter light matches with the overall cool white of the kitchen. Did you notice how cool it was to make the windows have different sizes? The designer sure made it look fun and unique with the addition of 3 pendant lights by the kitchen counter and another cute one by the dining table. 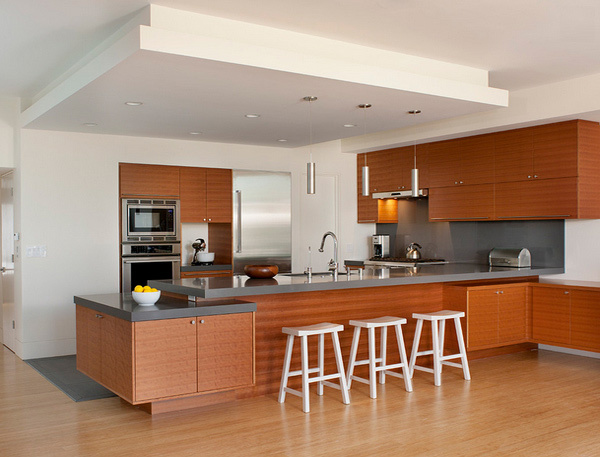 Sleek, white-glass cabinetry, mirrored pendants hung over the island and natural limed wood flooring create a contemporary feel in this spacious kitchen. 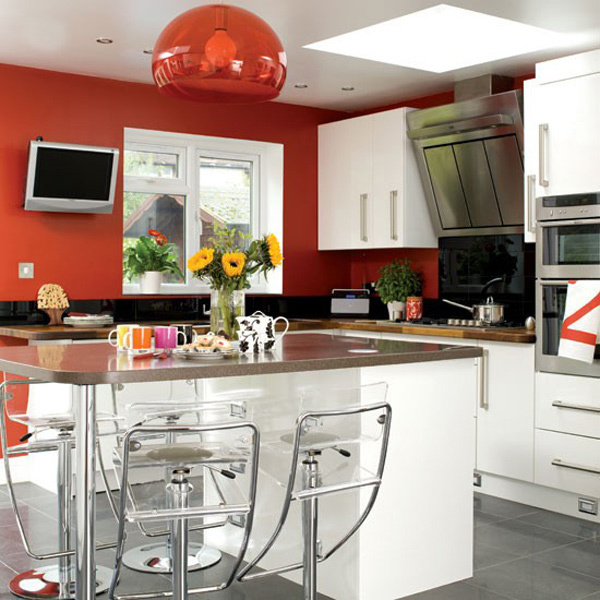 Striking cabinetry is teamed with chic white hi-gloss units to achieve a stunning effect in this kitchen-diner. 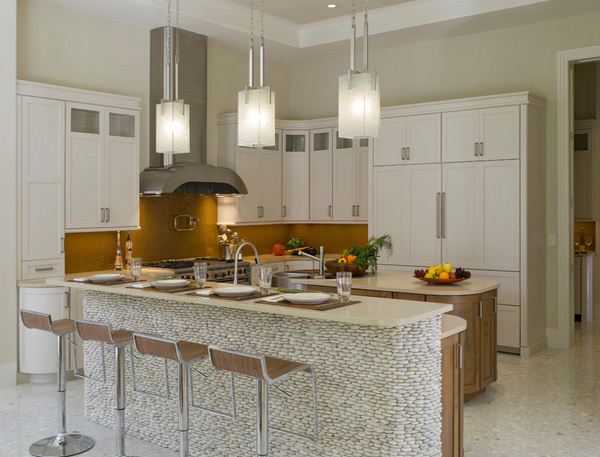 Bar stools line the central island to form a modern breakfast bar and pendant lights above create a stunning focal point. 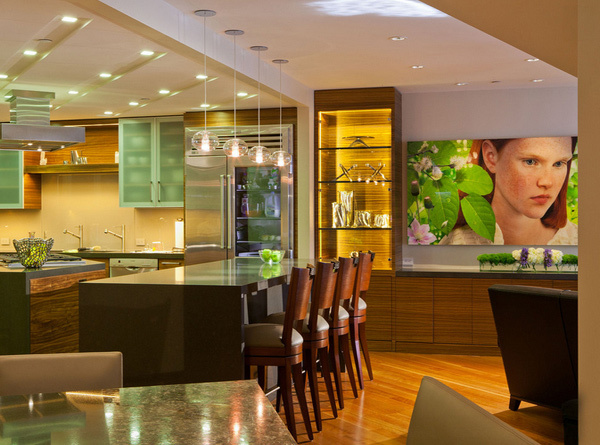 Since a kitchen is a working room, task lighting is of importance – it is never an overstatement. But like what we said above, we can’t stop designers and homeowners of their choices because they wanted their lighting to be noticed and we can say that they made the right choices when the lighting fixtures are both functional and aesthetically beautiful. Hoped you like the 15 Distinctly Unique Kitchen Island Lighting Ideas we have prepared for you and please check out the 15 Unique Kitchen Tile Designs which will be helpful too! Have a great day!